Entering 2006, the fourth year of its occupation of Iraq, the United States and its coalition partners were at a crossroads. Iraq was falling apart as sectarian violence unfolded into all out civil war and terrorist networks targeted Iraqi non-combatants and U.S. Troops alike. The Bush administration and the Pentagon’s adoption of a new strategy focused on counterinsurgency coupled with the leadership of General David Petraeus as a change agent provided the spark that jolted the direction of the Iraq war and the U.S. military as a whole. The purpose of this article is to introduce the reader to the organizational psychology frameworks of the Burke-Liwtin model for organizations and Kurt Lewin’s three-step process by analyzing the immense change effort spearheaded by Petraeus to revolutionize U.S. military strategy in Iraq and its conduct of war. Organizational development expert Dr. Warner Burke defines an organization’s external environment as “the forces or variables outside the organization that influence or will shortly influence organizational performance.” During 2005 and 2006, the salient forces influencing pressure on the leadership of Multi National Force-Iraq (MNF-I) included the deteriorating security situation, waning support from the American public, growing frustration from American politicians, and instability in the Iraqi government. By the summer of 2006, sectarian violence between Sunni and Shia Muslims was spiraling Iraq into civil war. At its height, the daily civilian death toll in the capital of Baghdad reached 150. Alongside increased civilian deaths, casualties among U.S. troops also rose. With every subsequent roadside bomb or suicide attack, political and public support at home for the war waned. These and other forces, developed into a confluence of factors creating an impetus for change at the top of the military structure in Iraq. General Petraeus’ efforts to unfreeze the Army’s policy for warfare began well before his appointment as the Commander of MNF-I. With his marching orders from the Army Chief of Staff to “shake up the Army,” Petraeus assumed the command of the Command and General Staff College equipped with tangible field experience of both observing and implementing counterinsurgency doctrine in practice. With the goal of producing a new field manual on counterinsurgency, Petraeus wanted to “force a change in mind-set, to drive a wedge into mainstream Army thinking, and overhaul the official definition of war,” according to Fred Kaplan in his book The Insurgents. As with any change in policy, Petraeus’ efforts to publish what became Field Manual 3-24 Counterinsurgency experienced resistance from the Army bureaucracy in the form of what Burke classifies as turf protection and competition. According to Kaplan, the Army Intelligence Center objected to the new manual’s statement that all soldiers and marines could serve as intelligence collectors. Willing to compromise on the language without yielding his main intent, Petraeus directed his team to adjust the wording of the statement to describe them as “potential intelligence collectors.” Having exhausted other options to receive the Intelligence Center’s blessing on the manual, Petraeus, according to Kaplan, eventually resorted to pulling rank on the commandant of the Center stressing the urgency for publishing the manual right away. Dissatisfied with the status quo, Petraeus asserted his trademark willpower at the appropriate moments throughout the publication process to see the ambitious project to completion. Petraeus “injected a climate of urgency and expectation into the Multi National Force Command and every echelon below it." According to Burke, revolutionary organization change requires a “jolt” to the system. The jolt that catalyzed the unfreezing process for the strategic situation in Iraq came on January 5, 2007, when President Bush named Petraeus as the new commander for MNF-I and announced a new strategy for the war. Expounding upon Lewins’ three-step process, organizational psychologist Edgar Schein posits that creation of psychological safety is important to successfully progressing through the unfreezing stage. While attempting to create psychological safety, Petraeus also abided by Lewin’s tenant of creating urgency during the unfreeze process. According to Linda Robinson, Petraeus “injected a climate of urgency and expectation into the Multi National Force Command and every echelon below it.” While not derived from ethnographic observations or survey data, the war reporters and writers who followed him during the surge collectively assert that Petraeus’s leadership and change in strategy were prominent driving forces in successfully unfreezing the status quo in Iraq and to a degree the Army’s culture. During a change effort, Burke asserts that providing direction for the organization is the primary responsibility of the organization’s leadership. According to Burke, change leaders provide vision and influence while also using persuasive and presentation skills, serving others, and modeling the desired change in behavior. Leading the leviathan organization of MNF-I during the surge tested Petraeus’ skills as a change leader. A relentless communicator, Petraeus heeded Burke’s guidance regarding a leader’s responsibility for developing a vision for the future state and adequately communicating the plan to achieve that state. Despite the early signs of progress, the Petraeus-Surge change effort was rife with restraining forces common to organizational change efforts. U.S. combat deaths rose each of the first four months of Petraeus’s command, reaching a peak of 120 in May. Back home, Republicans and Democrats alike believed the surge was doomed and called for an acceleration of the withdrawal from Iraq. Remaining committed and staying the course, Petraeus demonstrated decisiveness with the risky pivot in strategy that placed the Sons of Iraq on the U.S. payroll and fueled the Anbar Awakening without asking for permission from Maliki or President Bush. He used battlefield circulation visits to facilitate feedback loops from subordinate commanders. Petraeus possessed the skill of scanning the environment for new, relevant information that Schein asserts as critical to the change phase. By the time Petraeus testified to Congress is September 2007, violence across the country and more importantly U.S. casualties, started dropping precipitously. As 2008 began, the security situation in Iraq stabilized enough to initiate the redeployment of the surge units and transition military operations to Iraqi Security Forces. Petraeus’s competency as a strategic leader and his capacity to enact the requisite capabilities as a change leader were critical to the strategy’s success during the change phase. Refreezing and sustaining an organizational change effort requires a process and infrastructure to maintain the new system. By 2009, the strategic mission in Iraq transitioned from a U.S.-led counterinsurgency to what strategists refer to as Phase IV or stability operations. To reinforce the new approach, the U.S. and Iraqi governments signed U.S.-Iraq Status of Forces Agreement that defined the rules governing the presence of U.S. forces in Iraq through 2011. Along with a change of strategy for Iraq in 2009, leadership at the top also changed as Petraeus transitioned out as the MNF-I commander to the post of Commander, U.S. Central Command. 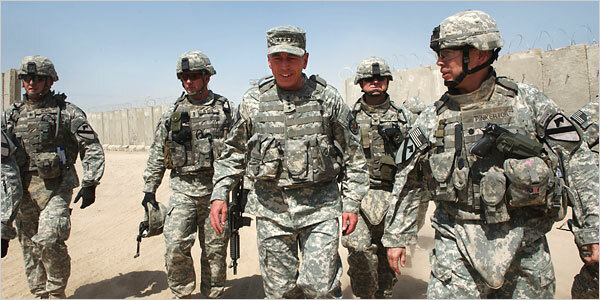 To facilitate this transition, the Pentagon selected General Ray Odierno to replace Petraeus in Iraq. These move sent a message of continued support from the Pentagon for the counterinsurgency and stability-focused strategies. Iraq [the results of the Iraq war] had forced massive changes to the Army’s equipment, training, and strategy. But the most important legacy of the war had been cultural. The war had upended most of the service’s basic assumptions about how it should fight, undermining the Powell Doctrine. In The Insurgents, Kaplan provides further support for Petraeus’ success as a change agent, writing, “David Petraeus and his fellow plotters succeeded in fomenting great change. By the time he hung up his uniform, the American Army had evolved into a different institution. It was more flexible, more adaptive; it was a learning organization.” By these accounts, the change effort achieved a cultural change that impacted beyond MNF-I and left a system-level imprint on the U.S. military and the country’s approach to future conflict. Petraeus’ detractors discredit the shift in strategy and in leadership as primary driving forces for the changing the situation in the fledgling war. Colonel (retired) Gian Gentile, in his book The Wrong Turn, refutes the claim that the surge was the primary cause for the decrease of violence in Iraq in 2007. He credits a confluence of other factors such as the Anbar Awakening as causal factors and is critical of the narrative depicting Petraeus as the “savior of Iraq.” Other critics highlight the retired General’s ambition and proclivity for self promotion, especially in relation to his efforts in publishing FM 3-24. Arguments by Gentile and others are important to recognize when reviewing the lessons from the past fifteen years. Without empirical evidence, analyzing the impact of Petraeus’ leadership and the effects of the surge on culture change at the Army organizational level is limited to anecdotal observations and subjective opinions, most of which are laudatory. Adopting the Army Operating Concept and the reintroduction of decisive action at the Combat Training Centers signifies that the Army recognizes the risk in pigeonholing itself to specializing in only counterinsurgency. In reviewing typical system-level responses to transformational change efforts, Burke argues that if only certain components of organization are changed, then revolution at best becomes evolution. The question to be answered is how the Army will continue to learn and adapt itself to meet the needs of a dynamic operational environment. Regardless of the criticism of Petraeus’ impact on the surge and the Army’s culture, the lessons of his actions as a change leader before and during the surge in Iraq serve as archetype for military leaders to study. The change effort he spearheaded to turn the tide in Iraq followed a process in congruence with the works of renowned organizational psychologists Kurt Lewin, Edgar Schein, and Warner Burke. The current generation of Army leaders has the benefit of rapid publication and analysis of strategic, operational, and tactical lessons from the battlefield. Planning, initiating, and managing change are inherent leadership responsibilities in our military as we are charged with continually improving the organization. Change leadership requires clear vision setting, adroit communication skills, generating energy, achieving organizational alignment, and other requisite leader competencies. This skill set applies at both the strategic general officer level and the tactical platoon leader level. I encourage readers to incorporate the models and constructs of organizational change and change leadership into their repertoire as they study military history, strategy, and leadership. David Weart is an active duty engineer officer currently serving at the United States Military Academy. He holds a Master of Science in Engineering Management from Missouri University of Science and Technology and a Masters of Arts in Organizational Psychology from Columbia University. He is the producer and host of The Leaders Huddle Podcast. The views expressed in this article are those of the author and do not reflect the official policy or position of the U.S. Marine Corps, the Department of Defense, or the U.S. Government. Broadwell, Paula. 2012. All In: The Education of General David Petraeus. New York, NY: The Penguin Press. Burke, W. Warner. 2014. Organization Change: Theory and Practice, 4th edition. Thousand Oaks, California: SAGE Publications. Gericke, Bradley T. 2011. David Petraeus: A Biography. Santa Barbara, CA: Greenwood. Kaplan, Fred. 2013. The Insurgents: David Petraeus and the Plot to Change the American Way of War. New York, NY: Simon & Schuster. Ricks, Thomas E. 2009. The Gamble: General David Petraeus and the Military Adventure in Iraq, 2006-2008. New York: The Penguin Press. Robinson, Linda. 2008. Tell me how this ends: General David Petraeus and the search for a way out of Iraq. New York, NY: PublicAffairs. Schein, E. H. 1987. Process consultation: Vol. 2. Its role in organization development (2nd ed). Reading, MA: Addison-Wesley. While the U.S. military was the predominant military presence in Iraq at the time. The headquarters command was technically a joint effort composed of U.S. and Coalition partner forces called Multi National Forces Iraq or MNF-I. General George Casey served as its commander until replaced by Petraeus in January 2007. Broadwell, P. (2012). All In: The Education of General David Petraeus. New York, NY: The Penguin Press. Kaplan, Fred. (2013). The Insurgents: David Petraeus and the Plot to Change the American Way of War. New York, NY: Simon & Schuster. Robinson, Tell me how this ends. Cloud, D., & Jaffe, G. (2009). The Fourth Star: Four Generals and the Epic Struggle for the Future of the United States Army. New York, NY: Crown Publishing. Gentile, Gian. Wrong Turn: America’s Deadly Embrace in Counterinsurgency. The New Press, New York, 2013.